Regardless of whether they were purchased readymade, homemade or elaborately produced, Christmas tree decorations made from paper are one of the earliest forms of Christmas ornaments. There is already written evidence of trees decorated with paper roses that were put up for Christmas from the year 1604. Industry and the cottage industry were involved in producing paper Christmas tree decorations in the 19th century. 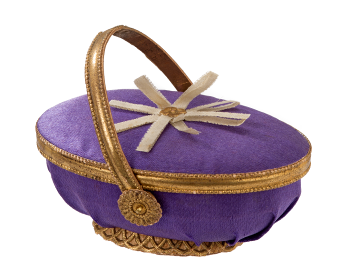 Countless tiny containers made of cardboard and crepe paper, small bags, baskets with lids, miniature muffs and all kinds of small boxes are witnesses to this era. These little containers were, for example, filled with sweets and hung on the tree, a form of Christmas tree decoration particularly loved by children, which was not just made out of paper but also out of other materials. With the rise of luxury papers the variety of Christmas tree decorations became even greater through die-cuts, cardboard figures with Venetian dew or mica. Cardboards that were embossed, stamped or finished in another way enriched the market in a number of ways. 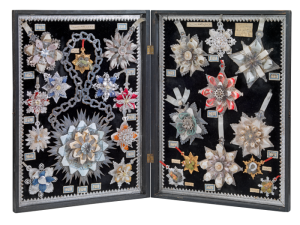 “Dresden cardboard” is the most common term for the extremely valuable two-dimensional or three-dimensional hollow figures today, which were hung on Christmas trees from roughly 1875 either covered with silver or gold foil or realistically painted true-to-life. The main centre of production was Dresden but Leipzig and Berlin were also important. 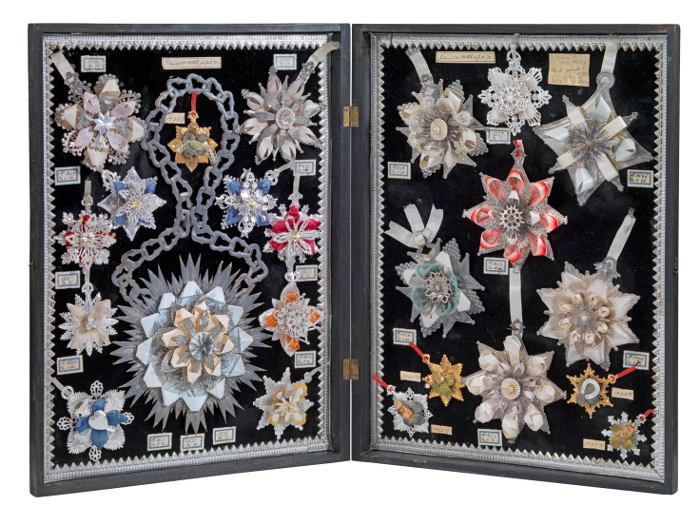 The cotillion medals industrially produced out of luxury paper between 1880 and approx. 1910 look rather strange to us on the Christmas tree. The cotillion was an extremely popular ballroom dance at that time and the cardboard medals were actually ball favours. As a result of its beautiful appearance they were often used as a Christmas tree decoration and appear very early in manufacturers’ Christmas catalogues.